I am Pauline and I am passionate by cooking, I created my cooking website three years ago. In this website, I provide each week new French recipes explained with pictures. Now, I would like to go further with my passion in providing lunch box. What is the concept of my lunch box? At my work, sometimes it is hard to find time to have a proper lunch break or lunch meal. Many of my colleagues are in the same situation, challenging day without time for going out for collecting some food to eat. In order to help them to have a healthy lunch, I have decided to launch a lunch box services. 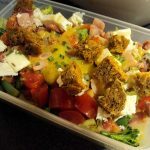 The main goal of this service is to help people to have a tasty and homemade lunch at work without spending hours in their kitchen or losing time to do grocery. How does the lunch box work? 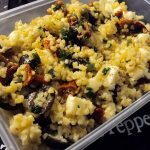 Each Saturday, after deciding a set of delicious lunch box (every week is different), I sent a text to all my customers and I provide the lunch box menu: each working day, a different lunch box. When the text is received, I collect the order by text as well. In order to be easy for everybody, all the orders need be placed on Sunday before 14h as I can source all the ingredients from the local market. You can order as many days as you want. If you want to have every lunch of the week is as fine as to order only one. Are you interested on this convenient opportunity? It is as easy as to send me an email to Pauline@pauline-cuisine.com and provide me your phone number (in order to receive the Saturday text) and work location (in order to confirm if the delivery is possible).